Do you spend more money on the liquid? Discussion in 'Vaping General Chat' started by Takedon, Apr 2, 2014. I've started using vapers because I thought they will be cheaper overall. And they were : I used to spend more on regular cigars than on the liquid for the vaper. What about you? Did you manage to save some money with it? I've absolutely saved money. My husband and I used to spend about $250/month on cigarettes. Now, we spend maybe $60 on liquids and tanks. I would like to cut that cost in half though, but at the moment, I'm happy with that number! Our vape shop has a buy 2 get 1 free deal on liquids so we can usually buy enough for a month and not have to go back each week! Same here, I spend a whole lot less on the items that one would typically buy on a regular basis such as ejuice. Unfortunately, I am kind of addicted to trying new tanks and mods to get that perfect setup so I have spent quite a bit over the past few months. But, if you factor out the frivolous spending i don't spend anywhere near what I used to when I smoked almost two packs a day. I just got a new rebuild-able tank in the mail today so once I have had a chance to use it for a few days, I will post a little review in the appropriate forum with pics and such. I mean.. I spent like 300-400$ a month on cigarettes and I spend like 80$ on vaping each month. This is great, guys! It's good to hear that you've saved a lot of money with it. I used to spend 120 dollars a month on regular cigs and now I don't spend more than 50 dollars on the liquid. About how much should the liquid even cost? I usually don't spend more than about 10 bucks for a 30ml bottle, Im in the the states like yourself. I usually order mine online so the shipping adds a couple bucks which usually comes out to about what my local vape shop sells the same size bottle for. Quick question: one thing I have noticed is that I do seem to be buying more liquid now that I've gone down in nicotine level. Is that unheard of? Am I vaping more to compensate for the nicotine level? Or do the lower nicotine levels evaporate faster? It's just something I've noticed since I've been using 6 mg liquid. You are probably vaping more to compensate, that happened to me so I kept a bottle of higher nic juice to give my regular juice a little boost when I felt I really need a quick fix. You might want to consider going back to 12mg for a bit while you are working to get off the real cigs, you don't need the lack of nictine fighting you while you break the oral fixation of real cigs first. All of my friends have saved more than 50 dollars with vapers. Liquid is simply superior, cheaper, healthier and smells way better than the other substances. I've been cigarette free for about three months now but I know it takes longer than that to really get over the nicotine. My dad made the mistake of just going to 0 mg straight from cigarettes. He ended up having to go back up. Yeah, I know I'm definitely done with anything higher than 11-12. I tried 16 mg and it was too much. I ended up with a headache! I need to keep a running tally of how much I'm actually spending on the liquid. I know I've definitely saved a ton of money but I don't want to get into the habit of spending more and more on liquid. I also need to break the habit of using disposable tanks. They end up costing me even more money every two weeks. 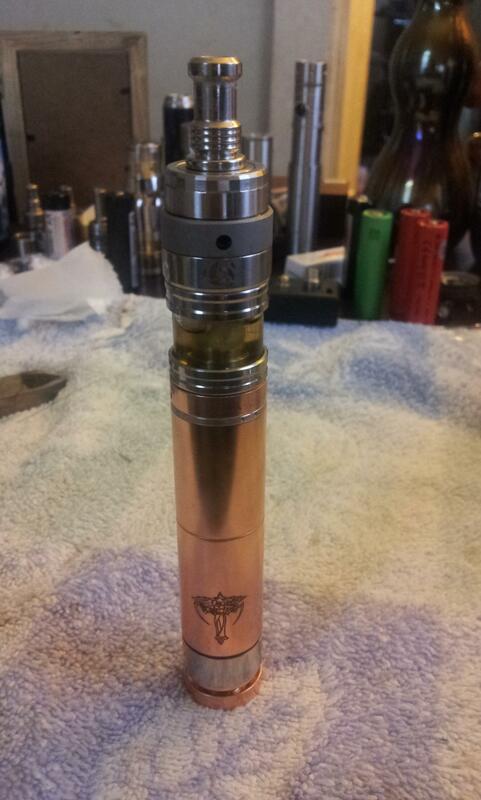 Plus, my mom bought a tank where you replace the coils and dear lord it tastes about a thousand times better. I'm definitely going that route, lol. Man oh man no kidding! Talk about a huge difference! I honestly did not know that it would make that big of a difference flavor-wise. I feel like I'm actually tasting the real flavor. I think the disposable tanks are great for first starting out but after a few months, it really is time to move onto something better. I just bought new tanks this week so in a couple of weeks I'm definitely moving on to something better. I run dual coils in this rebuild-able tank and boy does it eat up the juice, just fyi in case you notice you are using more. It seems that different flavors have different prices too. If you stick to the cherry flavor (which is the cheapest in my region) you will definitely save a lot of money! I have to agree that vaping is much cheaper than smoking. I generally spend under $50 a month on vaping, while I used to spend more than $200 on smoking monthly. Well, that's good as many people might start vaping because of the huge amounts of money spent on cigarettes. I spend less money on the liquid. About 20 dollar or even less per month. It's by far way cheaper than smoking cigarettes (100 dollars or even more each month). Besides that, there are some sales and I can save even more money. I agree. The sales are pretty good and they happen quite often, which is great news for all of us who are on a lower budget.